One Direction may be the current boy band sensation, but they still have a lot to live up to if the reaction that 1970s heartthrobs The Osmonds received in Aberdeen last night is anything to go by. 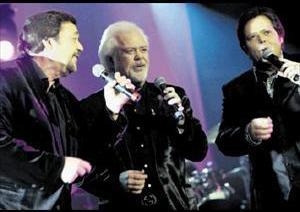 Three original members – Merrill, Jay and Jimmy – took to the stage at the Music Hall in front of a packed and very excitable crowd, revelling in reliving their youth. There were plenty empty seats throughout the performance — not from lack of fans but from crowds rushing to the front of the stage to handed teddy bears and chocolates to the band.